ComeOn! Casino are all about keeping things simple. They don’t mess around with complexities, they just want you to get on with gaming. This applies to the design of their site as well so flashy graphics and enticing ad banners are nowhere to be seen, which also means you get a streamlined and fluid instant play gaming experience. The site is heavily powered by Microgaming with over 200 games on show, but if you aren’t a fan there are twice as many titles from other industry giants, including Slots, Video Poker, Live Games, and some Jackpots that are ripe for the plucking – £5,000,000 anyone? Thought so. Opening in 2008 and based, like so many others, in Malta, ComeOn! have had gradual yet consistent success, and since they lean heavily towards ease of use over all else, they are a very comfortable casino to play at. A good place to start, perhaps, if you are new to the online gaming world but don’t want to compromise on choice. 20 spins for starburst on registration, 30x playthrough on winnings with £100 maximum. On 1st deposit get 100% match from £10 up to £25, wager the bonus and deposit amount 35x in 30 days to withdraw (see ComeOn for contributions of games to the rollover). Skrill/Neteller/Paysafe not eligible. 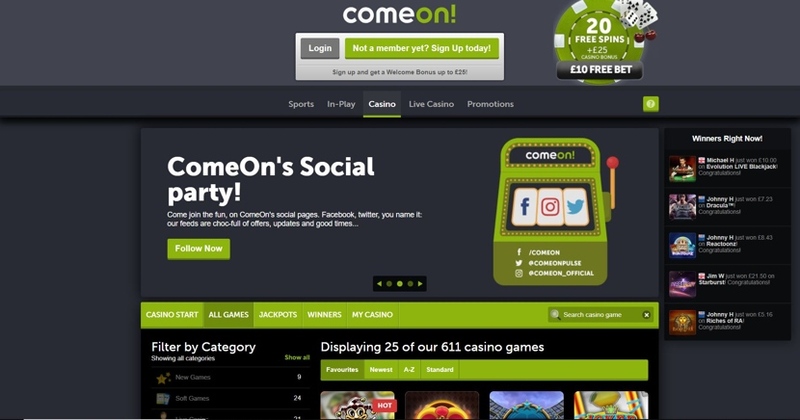 At first glance, with its faded grey backdrop peppered with occasional splashes of green branding, the ComeOn! Casino website looks unfinished. There is a lot of dead space and nothing going on to get the blood pumping. However, all is quickly forgiven after a few minutes of actually using the site, as you glide from one area to another and realise the benefits of all of the genuinely useful extra touches. The games load at super speed and can even play in the background while you browse the mini lounge for where you might be heading next. Finding games is never a chore, as you can use the search bar, A-Z, filter by category and even by provider. Speaking of which, some of the best in the business are here in force, with NetEnt and Microgaming boasting games into their hundreds, and Play’N Go, WMS and Yggsdrasil providing some solid support. 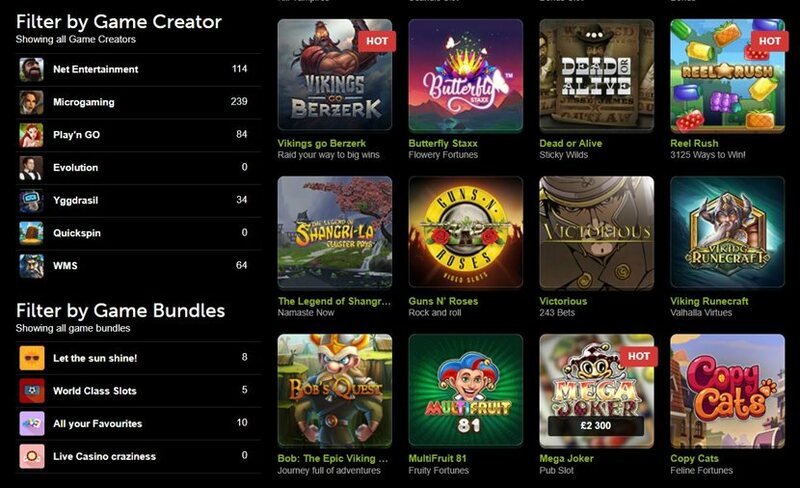 There are more than 600 games in total and just over 500 of them are slots. Boasting 20 of the 21 live games available, good old Evolution Gaming takes the reins in the Live Casino, which has its’ own dedicated tab – although this gives you the same result as selecting Live Casino from the category list so it feels slightly redundant. Features like My Casino allow you to track your activity on the site and create a favourites list, or you can explore one of ComeOn!’s game bundles reflecting current affairs; it’s World Cup fever at the time of writing so one of the bundles is football related. Allowing for a little personalisation goes a long way when it comes to brand loyalty. Slots – With 500+ slots of all kinds the full spectrum is well and truly covered. Gonzo’s Quest is ever popular, but Gemix and Gold King have both seen some big wins recently. Jackpots – There might only be 12 of them, but there is frequently over 18 million in total available collectively. Mega Moolah and Major Millions regularly hit 7 figures. Live Games – You’re in safe hands with Evolution (and a singular NetEnt effort), bringing you 21 Live Casino games. Norsk Roulette is one you don’t see very often, and Caribbean Stud may fill a void if you aren’t going on holiday this year. Blackjack/Roulette – There aren’t many of either, but just enough of each, and with varying stakes too. Try European Roulette or hop across the pond for the American version; give Single Deck Blackjack a shot or go for Blackjack Pro if you think you’re good enough. Table Games – 8 games with stake levels to suit all bank balances should suffice the card players among you. Red Dog, Pontoon and Baccarat are amongst them. Soft Games – If you are a newcomer to iGaming, check out the Soft Games. Just because they’re the easiest to play, doesn’t mean you can’t win big. Hook’s Heroes is a charming offering and Hugo provides endless fun. ComeOn! also employ a scrolling ‘Winners Right Now’ box which a lot of Casino’s make use of these days. Love them or loathe them, the one on the homepage is here to stay, but when you are playing a game (which will be most of the time, right?) you can disable it. Thinking outside of the box, ComeOn! give big winners their 15 minutes of fame by writing a short post about their win in the Winners section. It’s a great way to spread positivity, show which games are paying out, and also give players something to aim for – as well as a bit of an ego boost to boot. First things first, if you are an app lover then you are out of luck with ComeOn! Casino, as they don’t have one. All is not lost, though, because the mobile site does the job – albeit maybe not quite as well. 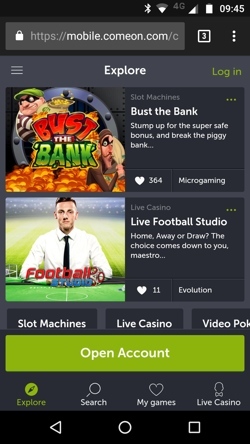 As is often the case, you won’t have access to quite the same number of games via mobile as you would via desktop, but that is understandable and is often down to the software providers rather than the Casino itself. What the Casino does have control over is how well the site performs, and we are sad to say this wasn’t a patch on the desktop site. We found the experience sluggish, the site slow to respond, and the design flawed. Endless scrolling seems to be the only option if you want to browse games, so best to go in with some idea of what you want to play and search for it directly using the search bar. Also, unlike the desktop site, you will need an account to demo any of the games. It’s serviceable, but it needs a re-think. Perhaps the problem is that they have one site that encapsulates both the Sportsbook and Casino; maybe a dedicated site for each would allow them to hone in on what players really need when playing on their device. It’s always disappointing to see fees applied to deposits and withdrawals, but we’re afraid that’s what could happen at ComeOn! If you are using Skrill or Paysafecard to deposit you will find yourself 5% down before you start, and if you make more than 2 withdrawals in a 30 day period it will cost you £5 per request. Co-Gaming is the company behind ComeOn! Casino, and they launched the product back in 2008. Based in the iGaming homeland of Malta, the company have maintained steady progress since their inception, and they are well regarded by players and reviewers alike, apart from one or two little blips along the way. While they don’t have the resources of some of the big boys, they have nevertheless managed to grow an impressive catalogue of games that keeps over 20,000 players coming back week after week, and in such a competitive market that is no mean feat. ComeOn! started as a Casino but added a Sportsbook a few years later, and this sort of slow and steady growth is a good sign for fans of the Casino, as it means not only is ComeOn! here to stay, but it is only going to get better as time goes on. It’s well hidden but it’s there. The little green square with the question mark inside is the door to help and support, where you can access Live Chat, the FAQ, and the E-mail submission form. There is no phone support available. They have tried to blend the FAQ and the Live Chat into one, no doubt in an effort to stem the flow of Live Chat enquiries, but it works well for the player too. If when you type your query it matches one of the FAQ’s you will be offered this as an answer. If it’s what you needed to know, great, you’re on your way. If not, or if there is no matching answer, you are offered the Begin Live Chat button. This encourages customers to think before they ask, leaving support available for people who really need it, thus allowing the support team to provide a better service, so we are a fan. One thing to flag: there have been rumblings in the community about the verification process at ComeOn! Casino, and while we aren’t suggesting anything untoward (they are fully licensed and a trustworthy business), be aware that you might be one of the unlucky ones who runs into an issue that will slow you down unless you have all your ducks in a row from the offset. Live Chat – Available 9am – 8pm 7 days a week, so not as contactable as elsewhere but a good service nonetheless. When we used it we waited about 5 minutes for an agent to become available. Phone – Not available. Disappointing. 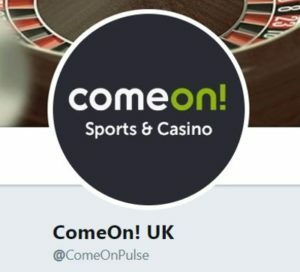 @ComeOnPulse – Very active account that seems to focus mainly on Sport as opposed to the Casino.